This name uses Spanish naming customs: the first or paternal family name is García and the second or maternal family name is Menéndez. García was nominated for the Academy Award for Best Supporting Actor for his role as Vincent Mancini in The Godfather Part III. He was Emmy Award- and Golden Globe Award-nominated for his titular role in For Love or Country: The Arturo Sandoval Story. Garcia was born Andrés Arturo García Menéndez in Havana, Cuba. His mother, Amelie Menéndez, was an English teacher and his father, René García Núñez, was an avocado farmer and attorney in Cuba who later owned a fragrance business in the United States. García has two older siblings, a sister named Tessi and a brother named René. When García was 5 years old, his family moved to Miami, Florida, after the failed Bay of Pigs Invasion. Over a period of several years, they built up a million-dollar perfume company. García was raised as a Roman Catholic and attended Miami Beach Senior High School, where he played on the basketball team. During his last year in high school, he became ill with mononucleosis, which convinced him to pursue a career in acting. He began his acting career by taking a drama class with Jay W. Jensen in his senior year at Miami Beach Senior High School. He graduated from Florida International University in Miami. García began acting at Florida International University but soon went to Hollywood. He had a short role in the first episode of Murder, She Wrote as "1st white tough", in 1984. He played the role of a gang member in the first episode of the popular TV series Hill Street Blues. He appeared in a supporting role in The Mean Season (1985), alongside Kurt Russell. Director Brian De Palma engaged him for The Untouchables (1987). García acted the Ridley Scott film Black Rain (1989) with Michael Douglas. That same year, Francis Ford Coppola was casting The Godfather Part III (1990). García won the part of Vincent Mancini, the illegitimate son of Sonny Corleone, and earned an Academy Award nomination as Best Supporting Actor for his performance. In the 1990s, García appeared in Internal Affairs (1990), in which he engages in a battle of wits with a corrupt fellow police officer, played by Richard Gere. He played a conflicted good samaritan in Hero (1992), the enabling husband of an alcoholic in When a Man Loves a Woman (1994), a doomed criminal in Things to Do in Denver When You're Dead (1995), a crusading lawyer in the drama Night Falls on Manhattan (1997), and a cop trying to save his gravely ill son in the action thriller Desperate Measures (1997). He played mobster Lucky Luciano in Hoodlum (1998). He portrayed the ruthless Las Vegas casino owner Terry Benedict in Ocean's Eleven (2001), a remake of the 1960 Rat Pack caper movie. He also appeared in the sequel, Ocean's Twelve (2004) and in the third film, Ocean's Thirteen (2007). He co-wrote, directed, and starred in The Lost City (2005) alongside Dustin Hoffman and Bill Murray. In 2006, he appeared in the last episode of the Turkish TV series Kurtlar Vadisi, along with Sharon Stone. Garcia has had a recent career resurgence in film. He starred in 4 films in 2018. In starred in the critical and box office sequel Mamma Mia! Here We Go Again as Fernando Cienfuegos alongside Cher, Amanda Seyfried, Lily James, Colin Firth, Stellan Skarsgaard, and Pierce Brosnan. The film is Certified Fresh on Rotten Tomatoes with an 81%, with the critics consensus reading, "Mamma Mia! Here We Go Again doubles down on just about everything fans loved about the original -- and my my, how can fans resist it?" When asked about singing with Cher, Garcia told NBC’s Today show, “It was sublime. One thing is to act with Cher who is a great actress and then to be asked to sing with her". Garcia also starred in the Paramount romantic comedy, Book Club, alongside Diane Keaton, Candice Bergen, Jane Fonda, and Mary Steenburgen. The film was a box office success grossing over $89 million worldwide against its $10 million budget. He also starred in Clint Eastwood's drama film, The Mule alongside Eastwood, Bradley Cooper, Dianne Wiest, Laurence Fishburne, and Michael Pena. It has grossed $166 million and received positive reviews from critics, who called it "poignant and charming" and praised Eastwood's performance. He also appeared in the acclaimed HBO movie My Dinner with Hervé alongside Peter Dinklage, and Jamie Dornan. Rotten Tomatoes gives the film an approval rating of 83% with the site's critical consensus reading, "My Dinner with Hervé offers a standard narrative on celebrity and infamy, but formidable performances by Peter Dinklage and Jamie Dornan find the dimensionality and pathos of Hervé Villechaize the man." The film received a Critics Choice Television Award nomination for Best Movie/Miniseries. García is slated to direct the upcoming film Hemingway & Fuentes about famous writer Ernest Hemingway co-written by García and Hemingway's niece Hilary Hemingway. Originally, announced stars included Anthony Hopkins, Annette Bening and García himself. Filming was originally to have begun in January 2013, but due to delays, Hopkins left the project and Garcia announced that the role of Hemingway would be played by actor Jon Voight. In 1982, García married Marivi Lorido. The couple has four children: daughters Dominik García-Lorido (b. 1983), an actress, Daniella (b. 1988), and Alessandra (b. 1991); and son Andres (b. 2002). García has expressed, on a number of occasions, his opposition to the communist regime that has ruled Cuba since the revolution that occurred there from 1953 to 1959. Following Fidel Castro's death in November 2016, García condemned his legacy, stating: "It is necessary for me to express the deep sorrow that I feel for all the Cuban people...that have suffered the atrocities and repression caused by Fidel Castro and his totalitarian regime." 1978 ¿Qué Pasa, USA? Pepe (Carmen's Boyfriend) Episode: "Here Comes the Bride"
1984 Brothers Jose Episode: "Happy Birthday Me!" 2011 The Simpsons Slick Publisher Episode: "The Book Job"
2012 Dora the Explorer Don Quixote Episode: "Dora's Royal Rescue"
^ Blau, Eleanor (July 24, 1987). "New Face; A Fervor For Film Pays Off: Andy Garcia". The New York Times. Retrieved April 25, 2010. 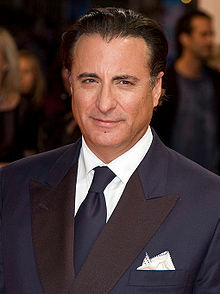 ^ "Andy Garcia Biography (2010–)". Filmreference.com. April 12, 1956. Retrieved July 7, 2011. ^ a b Aitkenhead, Decca (July 19, 2010). "Andy Garcia: 'The problem with producing movies? You get paid last'". guardian.co.uk. Retrieved April 27, 2011. ^ Drake, Tim (13 April 2012). "Actor Andy Garcia Fights for Religious Freedom in 'For Greater Glory'". National Catholic Register. Retrieved 2 August 2018. ^ "Andy Garcia Biography". The Biography Channel. Archived from the original on October 15, 2009. Retrieved July 7, 2011. ^ "Andy Garcia – Biography". Net Glimpse. Retrieved December 19, 2010. ^ Chitwood, Adam. "HEMINGWAY & FUENTES Finally Moving Forward with Anthony Hopkins, Annette Bening, and Andy Garcia". Collider. Retrieved March 24, 2014. ^ Kit, Borys (May 16, 2012). "Cannes 2012: Anthony Hopkins and Andy Garcia to Film 'Hemingway & Fuentes'". The Hollywood Reporter. Retrieved March 24, 2014. ^ staff (January 29, 2014). "Sir Anthony Hopkins exits Andy Garcia's Ernest Hemingway movie". Express. Retrieved March 31, 2014. ^ Molina, Melissa (February 4, 2014). "Interview: Andy Garcia Talks About 'At Middleton,' 'Hemingway & Fuentes'". Screen Crave. Archived from the original on February 27, 2014. Retrieved March 31, 2014. ^ "Andy Garcia's 'Twisted' Role". CBS News. February 25, 2004. 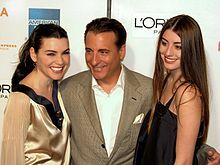 ^ "'Steal Big' star Andy Garcia was ready for a more light-hearted role. (Originated from The Virginian-Pilot)". Knight Ridder/Tribune News Service. September 29, 1995. Archived from the original on March 14, 2008. ^ "Andy Garcia, Family Welcome Arrival of New Son". San Jose Mercury News. January 30, 2002. Retrieved July 7, 2011. ^ a b "Andy Garcia condemns late Fidel Castro's 'totalitarian' regime". Belfast Telegraph. 27 November 2016. Retrieved 2 August 2018. ^ Ojito, Mirta (12 February 2005). "His Homeland, His Obsession". The New York Times. Retrieved 2 August 2018. ^ Strauss, Bob (28 January 2014). "Andy Garcia lightens up in rom-com 'At Middleton'". Los Angeles Daily News. Retrieved 2 August 2018. ^ Sullivan, Kevin (July 6, 2015). "Ghostbusters adds Andy Garcia and Michael K. Williams to the cast". Entertainment Weekly. Retrieved July 6, 2015. ^ "Andy García recibe Medalla de Oro al Mérito en las Bellas Artes del Gobierno español". Diario Las Américas (in Spanish). 23 December 2017. Retrieved 18 February 2019. Wikimedia Commons has media related to Andy García. "Andy Garcia interview on his City Island diet". Finance Foodie. March 2010. "Andy Garcia interview for Smokin' Aces". MovieHole.net. Archived from the original on 2007-01-11. Boutilier, Corey (Executive Director} (March 21, 2006). "VIDEO: Andy Garcia at the Miami Film Festival and his new independent film 'Lost City' (Andy speaks to independentfilm.com about his new film set in 1950's Cuba. The film had an emotional screening at the 2006 Miami International Film Festival. (TRT 5min, 9MB)". IndependentFilm.com. Bradshaw, Lisa. "Andy Garcia – Film star returns to Ghent after 22 years: 'I've come full circle'". Flanders Today. Archived from the original on 2010-11-24. "Photos "Cristiada": Andy García filming in Durango, México". HoyCinema.com Blogs.